Global warming is steadily progressing. Because of this, the weather will become more severe and erratic, threatening Japan in the future. In considering future climate change, we should know about the global climate change in the past. How has the climate of the earth changed over the past hundreds of thousands of years? In what situations has the Japanese archipelago existed? Knowing what has happened in Japan will be a good guidance for considering Japan’s future. Figure 1 shows global temperature change over the past 340 thousand years. It comes from numerical data provided by a professor at the National Institute of Polar Research. This is numerical data of oxygen isotopic composition collected by the National Institute of Polar Research by boring into the ice sheet in Antarctica. The figures show atmospheric temperature in the past. There was an enormous amount of data, so that they calculated the average over 200 years, and computed moving average deviations over 3,000 years. As this figure was produced by my colleagues, civil engineers, it lacks geophysical precision. But it clearly shows the long-term trend of global climate change. This figure clearly shows the Wisconsin Glacial Stage twenty thousand years ago and a warming period in the early Jomon period about 6,000 years ago. According to the figure, the average temperature over 200 years in the early Jomon period was two degrees higher than that of today. We must pay careful attention to the fact that the figure was not that of an instant but the average over a 200-year period. It was already verified geologically that the sea level was several meters higher in the early Jomon period than today. This is because glacial ice had melted, increasing the amount seawater or because rising the seawater temperature caused it to expand. Countries potentially impacted by rising sea levels caused by global warming are island countries surrounded by the sea on all sides, and developed countries with large coastlines: the United Kingdom, the Netherlands, the United States, China and Japan. One country suffering the worst damage is Japan. This is because most of Japan’s big cities are located on alluvial plains, low-lying areas facing the sea. This is a reproduction of the Japanese Archipelago when the sea level was several meters higher than today. Figure 2 is a hypsographic map of the Kanto region in the 21st century. 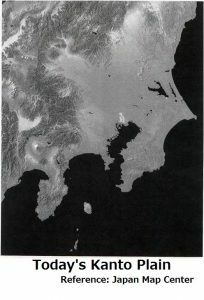 If we raise the sea level by five meters on a computer, the map will depict conditions in the Jomon period (figure 3). 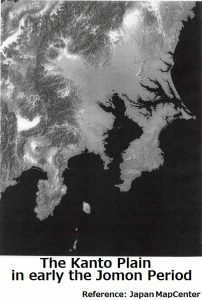 The coastline was extended far into the Kanto region. In the Jomon period, the Kanto region was under the sea. Figure 4 shows the landscape of the Kanto region when Ieyasu Tokugawa built Edo 400 years ago. At that time, both the Tone River and the Watarase River flowed into Edo Gulf, not Choshi in Chiba Prefecture. In those days, the atmospheric temperature showed a cooling trend, with sea levels dropping and coastlines receding. The Tone River, the Watarase River, the Ara River and the Tama River continued to carry soil and sand into Edo Bay, which had been under water in previous times. 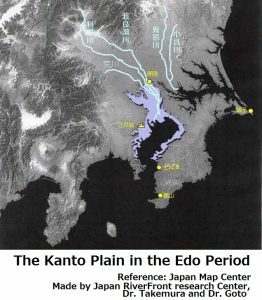 Edo Bay was a vast wetland where earth and sand from the rivers had accumulated. Ieyasu Tokugawa started a project to change the flow direction of the Tone River towards Choshi, known as Improvement Work on the Tone River. As flood waters flowed towards Choshi, the soil was improved to create dry rice fields. As a result, the Japan’s largest alluvial plain was shaped. However, the fact still remains that the Kanto Plain was a wetland and is vulnerable to flooding. When sea level rises, the area is exposed to the threat of storm surges from the sea. But this is hardly the case only with the Kanto Plain. It is a common risk that holds true for every plain around Japan. We can see signs of global warming nowadays in the 21st century. When I was an elementary school student, I was taught that the earth was in a phase of global cooling. Comic books and science fiction novels were full of stories of global cooling. 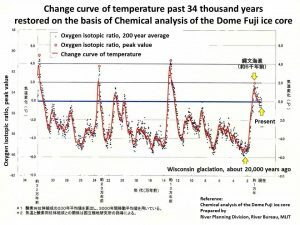 I can see that the earth was in a phase of cooling from figure 1, which shows the trend of atmospheric temperature from the Jomon period to today. But nowadays, it is said the earth is warming. This means that the cooling trend suddenly changed to warming with a dramatic V-shaped upturn. We are witnessing large-scale global climate change within our lifetimes. I can hardly believe even today that it is truly happening. When global warming progresses, the Japanese archipelago will be threatened by two menaces: severe and erratic weather and rising sea levels. Severe and erratic weather causes unprecedentedly heavy rains. This will attack us from the mountains. A rise in the sea level causes storm surges repeatedly year after year. This will attack us from the sea. Japan is on the front line of global climate change. During the Stockholm World Water Week 2018 -2020, the Asia-Pacific Water Forum (APWF) served as an overall coordinator of the Asia Focus Sessions, having been exchanged the Memorandum of Understanding with Stockholm International Institute (SIWI). In the Stockholm World Water Week 2018, under the overarching theme of the Week “Water, Ecosystem and Human Development”, the APWF co-convened the following 4 sessions with its partner organizations as part of realizing the “Yangon Declaration: Pathway Forward” adopted in the 3rd Asia-Pacific Water Summit in December 2017. From 16th to 21st September, the IWA World Water Congress & Exhibition was held at Tokyo Big Site. The IWA World Water Congress & Exhibition is one of the most influential events in the water sector. It was attended by nearly 10,000 leaders in water-related fields from 98 countries. The opening ceremony was honored with the presence of this Imperial Highness the Crown Prince of Japan. Speeches were delivered by Ms. Diane d’Arras, president of the IWA, Ms. Yuriko Koike, governor of Metropolitan Tokyo, and Mr. Keiichi Ishii, minister of Land, Infrastructure, Transport and Tourism. Dr. Norihito Tambo, vice-president of the JWF also spoke. The Asia Water Forum 2018 was held at the headquarters of the Asian Development Bank (ADB) in Manila, Philippines, from 2nd to 5th October. The purpose of this international conference was to provide a platform for sharing knowledge and experience on water information, technology and innovation, which will contribute to the improvement of projects for tackling water challenges across the region. It will also help achieve the ADBʼs action plan up to 2030: “Strategy 2030”. JWF made a presentation as part of a follow-up to the outcome of the 3rd APWS and ran exhibition booth to showcase products and services related to water & wastewater treatment developed by JWF member companies, and provided information about Japanʼs activities regarding water cycle management.